Over a span of ten minutes on the afternoon of October 10th, the park received reports of two visitors requiring evacuation by means of technical rope rescues from two separate locations. A 35-year-old canyoneer in Pine Creek Canyon had jumped five feet into a pool of water. He thought that the pool was deep enough to cushion his landing, but landed on a ledge hidden just below the surface. He broke his fibula and was unable to bear any weight on his injured leg. Ranger/Medic Matthew Chuvarsky rappelled through the canyoneering route to the man’s location. The Canyon Overlook Trail follows the rim of Pine Creek Canyon; rangers set up a lowering system to lower a litter and attendant from the trail to the man’s location, then raised him and two attendants 350 feet back to the trail. The second injury occurred in Hidden Canyon, where a 51-year-old woman jumped a short distance while she was down climbing an obstacle. She also suffered from a broken fibula. Evacuation of a victim from Hidden Canyon requires the construction of a 400-foot-high line to bypass a section of the trail carved into a cliff face. Ranger/Medic Matthew McCarthy hiked to the woman’s location and explained the challenges of a litter evacuation to her. She decided to attempt to hobble out of the canyon with assistance from crutches and rangers and was able to complete the task. A litter team met her just past the cliff face and carried her to the trailhead. 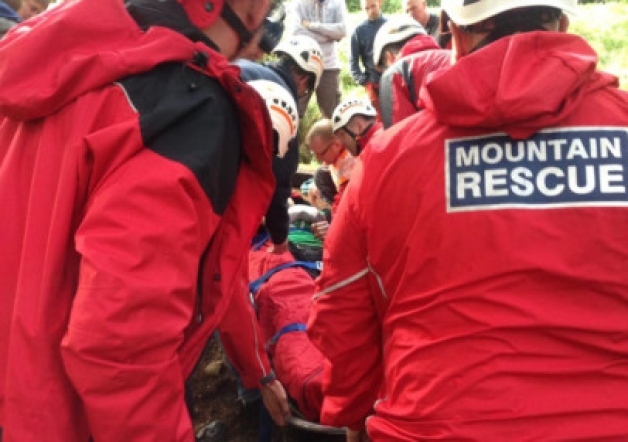 Twenty-five SAR team members assisted during the two incidents. Jumping, as opposed to using a rope or down climbing, is the leading cause of preventable injuries in the Zion Wilderness. This entry was posted in Search and Rescue, Survival Weekly and tagged backpacking, climbing, fishing, hiking, Hunting, mountain biking, search and rescue, Search and rescue stories, wilderness emergency, wilderness medicine, wilderness survival, Zion on October 20, 2014 by bigpigoutdoors.